Yeah, if you are of a certain age, you remember the legend, the folklore, and the tales of the infamous Rudolf Wanderone Jr. He was a character who became known through his own cunning, cleverness, and ability to assume any truth. You may know him as Minnesota Fats. Lore has it that Etta James was his illegitimate daughter. 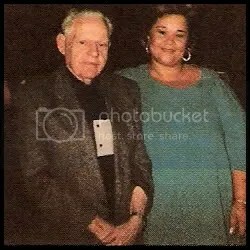 And Etta James believed that he was her father. Well, let me assume the truth and tell you that there was a night some 20 years ago when I met up with Rudolf Wanderone, Jr. That’s right, the self-proclaimed Minnesota Fats and I ran into each other in a bar. …And that night I beat the legend. 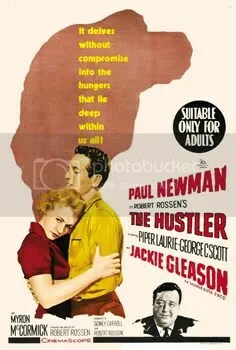 Most people became acquainted with the wily Wanderone through the classic Paul Newman film The Hustler. Wanderone was originally known as New York Fats among other aliases and nicknames. However, some said he appropriated the name to anoint his own fame. He was a conversational opportunist. 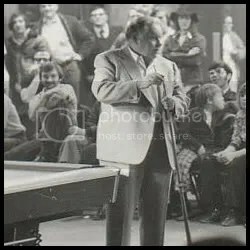 If there was an opportunity that arose amidst any chin wag, Fats was ready to go with it. Truth was what you made it. Fats was every bit the persona portrayed so brilliantly by Jackie Gleason. Was the movie made about him or did he just assume the role? I was in Nashville for a day or two attending a Christian music sales meeting two decades ago. I managed a joint venture between Word Records and Sony Music. Word’s point man was Tom Willett, a music guy who ran with Tonio K, T Bone Burnett, and Mark Heard, among many other superbly talented music makers. He was an unlikely character, and yet maybe the perfect one to lead his company into the wider mainstream music market. He loved a cigar, a good glass of wine, and his wonderfully irascible personality won the hearts and minds of us music heathens at Sony Music. This joint venture made Tom and I running buddies. One of our ongoing tasks was to determine what Word acts to release into the mainstream retail market. When we would attend these periodic two-day Word Records sales meetings, we might be confronted with 20 or 30 new albums with artists campaigning us relentlessly to escape the humble Christian bookstore marketand get into the “real” music business—whatever that was.. So Tom and I would spend two days getting “worked” by many of these artists. On this particular occasion, we spent the entire day listening to new music, watching videos, and reviewing marketing plans, and the entire evening attending a private showcase of a half dozen artists at a downtown Nashville club. After all the ‘grip & grins’ and backstage promises, Tom and I escaped about 11 PM in dire need of the grape. Although we both knew our way around the clubs and bars and restaurants in Music City, we ended up stopping by the bar in the Hermitage Hotel, a venerable, but weathered downtown hotel. The intimate bar was located on a lower floor below the main lobby, and a handful of quiet drinkers were nearing their last lap before closing time. This wasn’t a music business hang-out. Tom and I were off the path. As we embraced our first glass of chardonnay, a rotund man, slightly seedily dressed and easily in his 80’s approached our table. He was obviously the host of the bar and took theatrical pride in announcing to us that he was the legendary Minnesota Fats. And this boastful codger did it with style. He had clearly assumed the style of W.C. Fields, and the words of Mohammad Ali in declaring “My boys, I’m the greatest that ever lived!” Word has it that even Ali declared that Fats was the only braggart greater than himself. Well, the round man had me at his first exaggeration. Yeah, I had spent the day at a Christian music sales meeting, but I grew up with pool stick in my hand and with a small-town gambler’s heart. I’d spent the day listening to Jesus music, but I was about to spend the night listening to the tune of the devil. 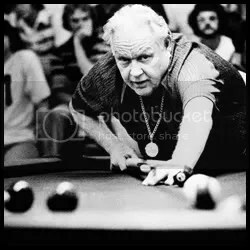 I knew about all of the billiard legends – the Cicero Murphy’s, the Luther Lassiter’s, the Willie Mosconi’s. These were the genteel men of the cue who had battled the likes of hustlers of Minnesota Fats’ ilk in sleazy pool halls and elegant ballrooms from Chicago to Norfolk to New York. Those were the big names on the billiard circuit of the ‘40s and ‘50s. These were the men who created the storied world that was portrayed in the seminal film The Hustler. In 40 years of being in the music business, I don’t ever remember even once asking any artist for an autograph… but I was asking for one from Minnesota Fats’. This was like meeting Capone or Gandhi. The fact is, Fats was a little of both. You see, Rudolph Wanderone Jr. was now a resident of the Hermitage Hotel. He graced the barroom every night to pay his rent. It was just another hustle in his eighty some years of survival. I’m sure many of these nightly patrons just didn’t know the legacy of the man. He made a living from racking up the balls and separating young sailors ready to ship out to a World War from a paycheck they might never have a chance to spend. 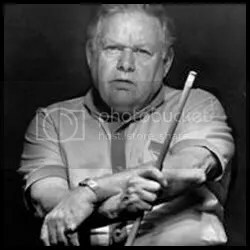 “I never lost a game for money in my life,” The King of Pool extolled. I continued to dog the old man for his signature. Each time he turned me down, and he got more and more proud of it. Yeah, he was Minnesota Fats. He didn’t sign his name for the unwashed! Didn’t have time. Couldn’t stoop that low. But as the lounge crowd diminished and the evening passed midnight, I saw the man start to cave. He went off to some cloakroom and came back with a bar napkin. “Here ya go kid. Here’s my card, he said with a slight ‘get off my back’ sentiment. 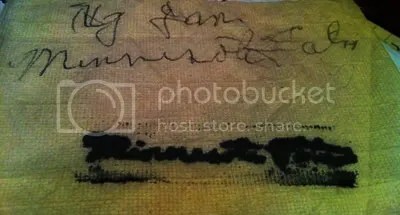 The napkin was stamped “Minnesota Fats” with no other information on it. It was clearly his hand-out to avoid the unnecessary effort of signing autographs that would become a burden to a man whose priority was to extract the cash from your wallet. There was no pool table in the lounge, so I had him at his own game. He couldn’t stand up to the challenge because there was no table to fend off another Young Turk who called out the legend of Minnesota Fats. Yeah, I had him, now gimme that autograph! Then, I remember somehow we were climbing the stairs up to the cool air of a dark, expansive empty lobby. Fats wanted to show me something. 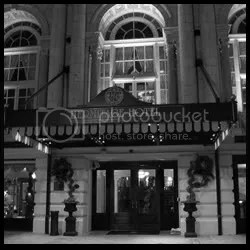 The old hotel seemed to go back in time. What year was it? And then the man in the old crumpled suit coat reached up and turned on a lone light… over a pool table in that lobby of the Hermitage Hotel. “Holy S___! The old man had me. Here I was three drinks in, bragging, and he suddenly had a pool table. Now, he was asking what was I going to put up against the chance to win his autograph? Yeah, we played pool that night. He suckered me in. My head was spinning. I racked the balls. “Make it tight son… don’t give me no loose rack,” he ordered. Then he acquiesced. “Go head kid, you can break,” as if that might be my only shot. He laughed. Nothing better than getting a little static. It gave him complete license to give it back. We played into those earlier hours of the morning. Me against this 80-some year-old man. 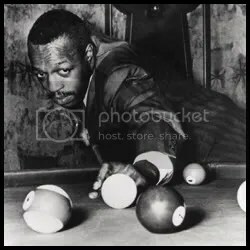 He was surgical with that cue. I battled him shot for shot. I can’t tell you exactly what happened. I don’t remember. It was late. I was drinking. Did I beat the biggest legend in the history of billiards? I’m going to tell you I did. And if you want to know any different, you go ask Fats. He’ll tell you. And if you need any further proof. I got that napkin with the Minnesota Fats stamp and right next to it is the sprawling signature of the man himself.You could ask Tom Willett about the game, but I think he went outside and smoked a cigar. You know there is truth in a good cigar.